In 1862 fifty percent of the population lived on farms in the United States as opposed to two percent today. 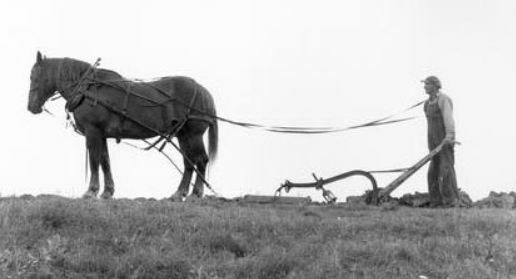 Farming before mechanization was a full-time family enterprise requiring the muscles and sweat of many hands. Families were large, and children labored from early ages. Farming was hard, but it was also a way to survive and prosper. The year before 1862 had been a year of economic depression throughout the country. But 1862 was a New York farmer’s golden opportunity. The weather was reasonable. The markets for farm produce growing to meet the demands of a hungry army. Despite their lasting edifices, the Neuman family left no written record of their experiences during the war. However a bit down the road from them in Unitaria, lived Isaac Hurlburt. He was born in 1804 and died in 1879. He had seven children, four of them sons. In 1862 they ranged in age from sixteen to thirty-three. Two were married with six children between them. The sixteen year old was still attending the local school. None served in the war. Isaac kept a diary for the year 1862. It’s a little thing, three by six inches in size, with a thin black leather cover. Yet inside, in the terse phrasing of a busy man, it details a year in a farmer’s life. He recorded the weather, the work he and his sons accomplished, the people they visited and who visited them, what he sold and bought, and the family sicknesses and deaths. Isaac began the recording his year with great diligence and stuck with it, only a handful of days skipped with most of these at the end of the year, making this an invaluable record of the farmer’s round. Isaac and his four sons and son-in-laws did much of the work together. The youngest boy attended school, but joined the men when he arrived home. Occasionally one or more would work other farms using their teams and equipment. What did they do? In the cold days of winter when the ground was frozen they mostly sledded logs out of the woods to be sold to the saw mill, but also threshed oats, broke horses, and lambed sheep. Good sleighing weather, as Isaac called it, was also the time for visiting. Visitors were often family, and when the weather was unsettled they stayed overnight. By March the stored hay and oats were petering out and the men chopped fodder almost daily. The cows commenced calving and sixty maples were tapped in the sugarbush. And there was always wood to split. In late April fields were plowed and oats, rye, potatoes, and a small plot of peas planted. Planting continued through May. An ox team broke ground for buckwheat, and then corn. The planting done and while his sons traveled around neighboring farms plowing and sowing, Isaac spent a week building a stone wall and experimenting with a newfangled dog powered butter churn. “Had middling luck.” Isaac recorded. On Sundays the family went to meeting to hear the circuit preachers and meet with neighbors or stayed at home. No work was ever done, but there was plenty of visiting and sometimes a choral performance in the evening. Through the heat of July fields were hoed, dragged, raked and haymaking started in earnest. Haying occupied most of August putting two to three loads of hay in the barn on a dry day. Haying was followed by cradling, raking, and binding the oats. Peas and wheat and corn were the last field crops to be harvested. By mid-September the men were back in the woods logging, stumping, and clearing land. It was a busy life. And what about that war going on? Isaac made only two notations in his diary. On January 25 he wrote “news of a battle in Kentucky” [probably Mills Springs] and on April 11 “a great battle in Pittsburg [probably Shiloh]. For farmers in the north, the war was far away, for sure. We forget what life was like before electrically powered technology came along. I love being reminded and even discovering what people did when life was for the living. Work was life. I also find it invigorating to read about the small and probably insignificant places where it seems no big history occurred. BUT, it is all part of us and clearly it has become part of Dr. Koster!